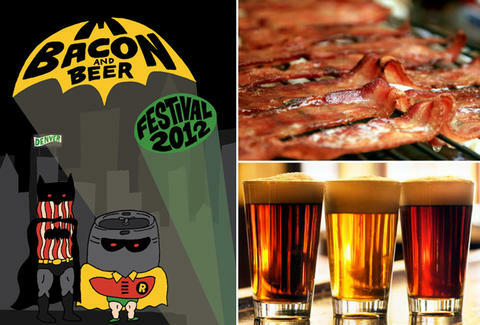 What with beer's long-known tendency to lead to porking, it's a wonder it took so long for us to get the Bacon and Beer Festival. Actually, it's been a ridiculously popular event in Boston for three years (those animals), but is only now primed to attack Denver -- specifically, Mile High Station. On Dec 9th. With 2.5 hours of unlimited beer from locals like Prost, Strange, Wits End, and Crooked Stave. And bottomless bacon dishes from our finest chefs, including (among the 20 expected) Euclid Hall's "play on an egg nog with bacon", swanky Colt & Gray's bacon cashew caramel corn, and The Bitter Bar's deep-fried, maple-cured/ hickory-smoked strips that're coated in Cap'n Crunch, also the festish-y dream of a cereal offender. If paying just $40 for all this awesomeness makes you feel like you're ripping off the organizers, they actually offer a "Baller Ticket" for $10 more that gets you... nothing (seriously! ), actually a pretty good example of the kind of thinking that kept them from expanding to Denver for so long.